I write this letter in confidence. Please keep it between us. As a lifelong New York Rangers fan the Stanley Cup has never gotten in my way. Until you came along. Once in my life, once in my sixty-six years, the Cup finals were worth watching. All the way back to 1994, Mark Messier kept his promise and gave us a Stanley Cup. There was nothing before that and nothing since. Heck, the Rangers didn’t even make the playoffs this year so I knew I had no June hockey distraction. And then you came along. First, I’m writing this letter to congratulate you on becoming Las Vegas’ first professional sports franchise, at least since the 1989-90 UNLV Running Rebels. And also to complain that your success has gotten in my way. Before I rant and tell you how you’ve impacted my life, let’s not jump too far ahead and lose sight of a couple of things weren’t supposed to happen this spring that did anyway. The Stanley Cup has been won annually since 1893 but never in the desert. You weren’t supposed to be in the Stanley Cup Finals, but here you are. In fact you weren’t even supposed to be in the playoffs. You are an expansion team. Expansion teams always stink with a roster of castoffs other teams didn’t mind getting rid of. Experts said you wouldn’t win twenty games during your first season, never mind sixty-three and counting. Sports books right next to your new home at TMobile Arena, across Las Vegas Blvd. from the MGM Grand, had you as 500-1 odds to win Lord Stanley’s prized possession. Anyone who wagered on you last summer did it not because they thought you’d win; they only wanted a souvenir from your first season. Now you not only have the home ice advantage but are the 7-5 favorite to win the Cup. Incredible isn’t a strong enough adjective. Unprecedented is. Everyone said hockey would never make it in Las Vegas but you didn’t play to an empty seat at home all year. Every game, all 17,367 seats were accounted for and hundreds more bought standing room and jostled for space like they were at the eggs Benedict station at Treasure Island during the Sunday morning $9.95 all-you-can-eat brunch buffet. Is this really your first year as a team? Is it true that no first year team in the modern spots era, post-1960, in the NFL, NBA, MLB or the NHL have played for a championship except for the 1967-68 St. Louis Blues? And that shouldn’t count because that was the year the NHL expanded and all the teams in the Western Conference were first year teams so someone had to play and lose to Boston in four straight. Eight teams in the league haven’t made the Cup finals this century but you did in your first try. Two of them are Toronto and Montreal, the blue-bloods of the NHL. But here you are, even more quickly than your owner Bill Foley predicted a year and a half ago when you still had no players. He said you’d be in the playoffs in three years and playing for the Cup in six. The laughing in Calgary could be heard all the way to Bellagio. I want to sit next to Mr. Foley at the blackjack table. Somehow with a bunch of throw-away players that nobody else wanted, you are the real deal. You won the first game you ever played on October 6 in Dallas and played at home for the first time on October 10, nine days after fifty-eight innocent concert goers lost their lives across from Mandalay Bay. Opening night was emotional and there wasn’t a dry eye. ‘Vegas Strong’ was born. You easily could have lived up to the name of the ‘Golden Misfits’ or the ‘Golden Castoffs’ but instead won fifty-one games during the regular season and had the fifth best record in all the league which included teams from real hockey cities like Boston, Detroit, Chicago and yes, gulp, New York. Thank you, but no need to remind me again the Rangers didn’t even qualify for the post season this year. You then won twelve more in the first three rounds of the playoffs and now you prepare for Washington in the first game of the Stanley Cup Finals tomorrow night. What’s that you say- if this is a dream don’t wake us? You can’t check out of a bakery in Las Vegas without a box of Golden Knight cookies! Having just returned Friday from Vegas, the excitement throughout town is contagious. Tickets are impossible unless you are ready to spend a dozen or so hundred dollar chips. 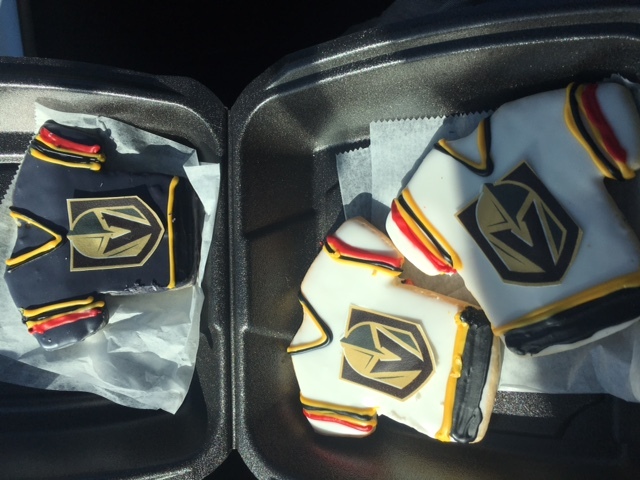 Golden Knights hats, shirts, bumper stickers, billboards, posters, casino promotions and even Golden Knights cookies in a bakery. People are even buying newspapers again to read about you. A year ago, 98% of your newfound fandom couldn’t explain icing, offsides and a power play. Today, probably 80% still can’t, but who cares because everyone is having too much fun with so much civic pride. The town hasn’t been in this much of a tizzy since Andrew Dice Clay opened at Bally’s. Truly it’s Vegas Strong. So how does this all impact me? It’s relatively simple- your success has gotten in my way. It’s something I guarantee neither of us saw coming. My wife and I decided a few years ago we would move to Las Vegas after I retired this June 30. Well, not really Las Vegas but the delightful, park and golf course populated community of Summerlin, eighteen miles northwest of McCarren International and only about a dozen miles from mid-strip. It’s far enough away that The Strip is not a distraction but close enough if we want it to be. It’s also convenient to our sons in Los Angeles, but it’s not California and that’s a retirement taxation plus. We knew exactly what we wanted: a gated community on a golf course with mountain views and though it took two years, and Andi having to send both me and our realtor Bob DePrez to the penalty box for scrapping a few times, we finally found it. We knew we wouldn’t be occupying the house for another eighteen months after we bought it. The original owners rented it back from us for a little while before vacating last July. We needed one more tenant to hold it until we were ready to move. Summerlin also happens to be your headquarters as you were assembling your team. In fact, our front door is about two miles from City National Arena, your corporate office and practice building. I had an inkling your players would be looking to rent their first year in Vegas as none of them really knew what their hockey futures held. At one time these guys all had their futures ahead of them. Now they were given walking papers and sent to the expansion trash heap. Somehow, instead of getting tossed into the dumpster, your coaching staff has recycled them from reclamation into champions. I had been in touch with your VP of ticketing, Todd Pollock, last May before you had any players and I bought two season tickets from a very limited remaining inventory. I knew I wouldn’t be able to use them this season but wanted to do something to support the franchise and have a ticket placeholder for the 2018-19 season when we relocated. I became not only the first, but still the only, Golden Knights season ticket holder in the state of Alabama. Roll Tide. I also figured at worst I could get my money back on the ticket resale market. Kyle Whittington, my financial planner, now calls me for advice. I sent Mr. Polllock an email last July telling him about our house availability and the location and asked him for a referral to your real estate reps that were helping players find housing. I knew it was a long shot but I wanted to get the property rented. You selected your roster from the league’s other thirty teams on June 21. The existing teams could ‘protect’ from the draft ten players and a goalie, which meant available to you were the twelfth best players from each team, not enough of a foundation to win many games. In mid-August I got a call from Debbie Ballard, our rental manager, that one of the newly selected Knights saw the house and liked it. Maybe there was something to my scheme after all? Later that day Ms. Ballard told me another party also had interest but he couldn’t skate; instead he was a vacation timeshare sales exec. Now, just like battling for a loose puck in the corner, there was a little bit of a scrum. The timeshare guy wanted the house for a year, or until August 31, 2018. The hockey player until May 31, though with the regular season ending in mid-April, and playoffs only a fantasy, I wasn’t sure why he wanted to stay that long but it was okay as long as he paid. Actually, the timing for the end of May was going to be better for Andi and me —we wanted to begin renovations in June and move in during late July or August. The timeshare guy offered to pay more. He never saw the property but if the house had a wall that he could hang his 96” television and a garage for his Maserati convertible, he was ready to sign a lease. However, he couldn’t produce a credit report. The hockey player was a former number one draft pick, a family guy, and had a seven-figure salary. Hat trick for the hockey player; tenant for us. 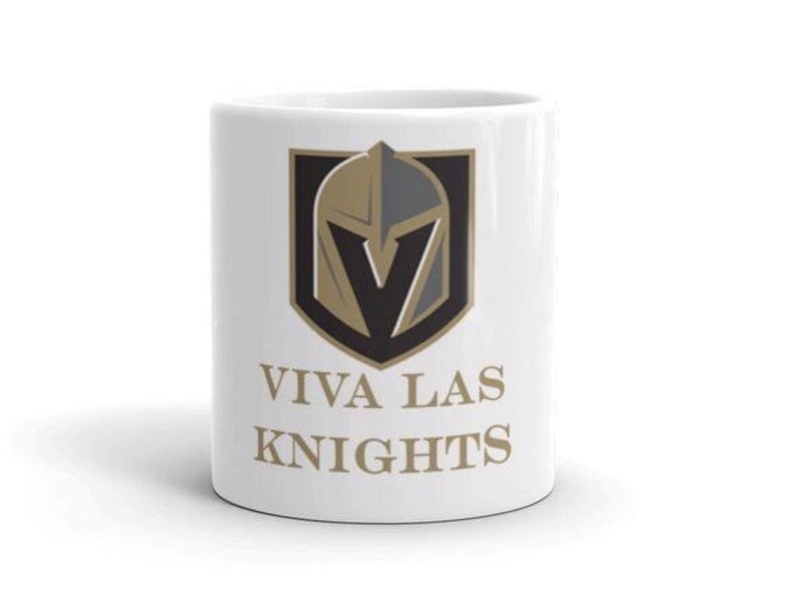 About three weeks ago I got a text from your player, our tenant, asking if they can stay past May 31 if the Knights make the Cup finals. You guys had already swept Los Angeles in the first round and now were playing San Jose. The road to the finals was still a long one, having to beat the Sharks and then the winner of Nashville-Winnipeg. I told him, “Sure, we’ll work something out,” knowing damn well it wasn’t going to happen. So now with our Birmingham house on the market we have to sit and wait for the playoffs to end before we can get into our new one and begin our remodeling, It’ll back us up three weeks, maybe a month. Life is on hold. The Stanley Cup is in my way. This never happens to a Rangers fan. You have turned my life into a pretzel, much like Marc-Andre Fleury looks successfully stopping a two-on-none break. Speaking of whom, the entire city of Las Vegas thanks the Pittsburgh Penguins for protecting goalie Matt Murray and making ‘The Flower’ expendable to the desert, where I need to remind you again, hockey will never work. Fleury has become your star, the face and the heart of the franchise and Pittsburgh, just to make sure the Knights drafted him, threw in a complimentary second round draft choice so they could shed six million dollars in payroll for a thirty-three year old guy who only won three Stanley Cups for them. Short memory Pens but thank you. Isn’t it wonderful that hockey, a physical, demanding sport with arguably the best conditioned athletes in the world, is also a game of great tradition? The handshake ceremony that follows each playoff round is always warm, especially the way these guys go at each other with such force once the puck drops only to take a moment and formally congratulate and console both winner and loser when the series ends. I can never get enough of that. And every winning player of the Cup gets their name engraved on the hardware. No other sport does that. 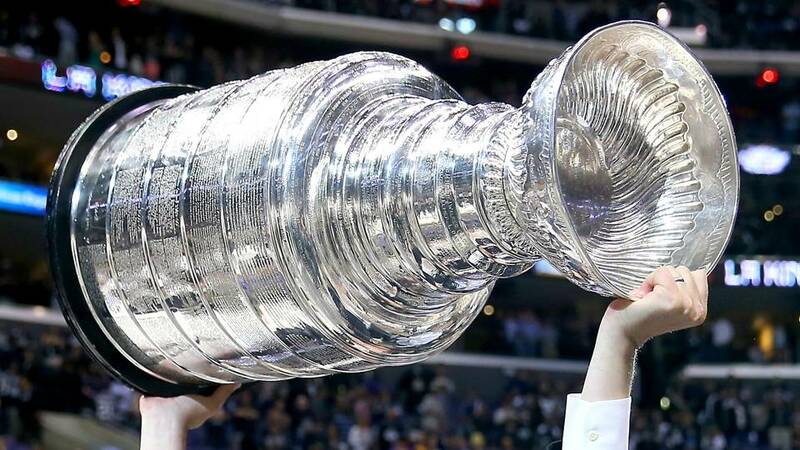 However, maybe my favorite tradition is each player on the Stanley Cup winning side gets to spend twenty-four hours with the hallowed Cup in their possession after the playoffs end. They can take it anywhere and do most anything they want with it. Wouldn’t it be ironic if the Stanley Cup spent a night in our house before we did? Well done Roy! Need a pic of the cup in pool. I think as story goes they found it the next morning at the bottom of Mario’s pool once. Oh yeah and special thanks too. I will announce that once it happens. Not going to jinx. Roy, I am struggling. I am a big fan of the other team that plays in the desert. I am devoted even though I have lived through salary dumping, ownership change and threats of moving the franchise. Just making the playoffs is a dream not fulfilled often. If the Cup does spend time in your house before you do, the player renting must—a condition of the extension—supply you with pictures of the Cup in every room! What a Great Wall montage that will make. It can go right next to your Comeback Player of the Year card. Great stuff as usual. Oh, how long does the Stanley Cup go (assuming seven games)? We’ll be in Vegas for the Kiwanis convention beginning June 26. Did you get playoff tickets also? Classic story, Roy, love it…Congratulations on your pending retirement. Great Saturday morning story… Interesting twist on having a hockey player as your tenant. Looks like your plans for retirement are all coming up aces!